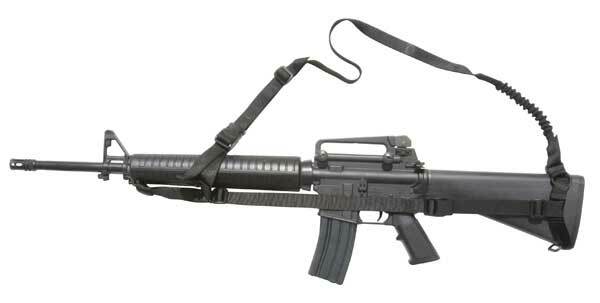 Problem: The weapons slings currently on the market are designed to carry weapons, period. Furthermore, the designs of conventional fore-aft mounted slings have not kept pace with the latest weapons developments. 3-point style slings have many drawbacks; they get snagged on weapon and body mounted gear, they are complicated to use and can be too specialized for all around combat use, and they don't give the wearer any flexibility when it comes to using the weapon as a no-fire fighting tool. Solution: The "MAMBA" - COMBAT Fighting Sling! The first weapon sling to incorporate a built-in S-T-R-E-T-C-H element to facilitate a "Barrel-Thump" against an opponent! Allows wearer to Muzzle-strike an opponent: Unique S-T-R-E-T-C-H feature allows wearer to strike an opponent with weapon muzzle "barrel-thump" while still having the weapon in a slung and in ready position. Instantly adjusts to telescoping buttstocks. Compatible with SOPMOD components: Static-side mounted "Traverse" strap keeps sling from tangling-up in weapons mounted sighting / lighting and carrying systems. "Speed-Adjust" shoulder strap design allows wearer to adjust on the fly with weapon shouldered for "Run & Gun" & "Off-hand" shooting. Fast and easy transitions: Tensioned triangle design virtually eliminates interference with body mounted load bearing equipment, especially during weapon transitions and rope-in situations. 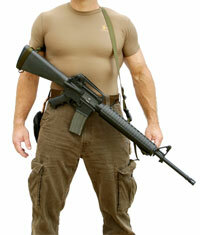 Speed-Lok feature allows you to position your weapon in a SAFE, MUZZLE-DOWN carrying position. Tubular design prevents twisting and snagging on other body mounted gear. Quick-adjust feature keeps the Traverse Strap perfectly tensioned in all buttstock positions yet out of the way of weapon mounted systems. Quiet and Fast: The "MAMBA" does not use any sort of metal snaps or clips, Velcro or any other noise making hardware. There is no clip and ring to re-set after each use -KEEP IT SIMPLE! Spec.-Ops. Brand from Best Made Designs. DEVELOP SAFE SHOOTING HABITS - "You are the only part of the weapons system that can make a gun safe - or unsafe" Go to www.nssf.org and LEARN the 10 rules of safe gun handling - then honor them!